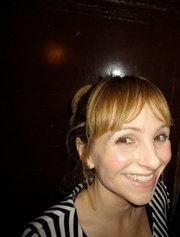 I recently interviewed Kate Burt, editor of south London’s new daily online magazine, the great belowtheriver.co.uk She told me a bit about herself, the magazine, what’s great about south London living and why Londoners CAN move around the capital! Londoners always seem quite tribal about being from north or south of the river. Do you think that still applies? Are people more willing to migrate either way? As you say in your intro to the magazine, south of the river used to get a fairly bad press. What do you think marked the change in attitudes and when do you think the change began? It’s cheaper. Eventually all things come to what they can afford – and decide to love it. South of the river is a huge area to cover – how do you try and make sure you’re covering all the areas? It’s hard! But the area we’ve naturally decided to cover – broadly the blob that spreads downwards along the curves of the Thames beneath London Bridge/the tip of Southwark – feels like a natural trail in a way. I live in SW9 but spend lots of time in SW2, Herne Hill, Loughborough Junction, Peckham, Camberwell, London Bridge, Deptford, Waterloo, the South Bank… And I think other south Londoners will have equivalent orbits. And I have stringers in the most far flung spots! That said – we are after new writers and reviewers – so please email kate@belowtheriver.co.uk if interested. What have been the main challenges in setting up belowtheriver? To do it well you need to have more hours than the ones available. Other than that, I’m quite astounded at how smooth it’s been to go from a blank website (in Feb 2013) to launching in March, to gaining 20,000 monthly readers during the subsequent four months… and SO much positive feedback. It feels like we are part of a family that was there waiting to welcome us. People seem to really like what we do. Have there been any stand-out highs and lows so far? I’ve lived in south London all my life. Starting this website I have seen it almost as a tourist and discovered so much great stuff and fantastic people doing amazing things locally that I just didn’t know about. Knowing I’m now in a position to share all this great stuff to other people who didn’t know about it is pretty exciting too. Lows? Gah. Time versus money, the usual. But mainly we (as in me and the little publishing company behind Below the River and the award-winning Kentishtowner.co.uk) are just excited about the plans we have and how we are doing the best jobs we could ever have imagined doing. As a born south Londoner are there any particular features you especially love about the vibe of south London and how do you think it’s changed? Brixton Village and a lot of privately funded housing is going up in and around south London – obviously we need a lot more housing – what is your opinion on the gentrification debate. Ie development being good for an area but sometimes leading to locals being priced out? I get very emotional about gentrification. It’s great that Brixton Market is now full of life again – but do the people flocking to eat from delicious menus ever do their shopping from the greengrocers and butchers there? I think the problem with it is that there’s no Gentrification Monitor to say when enough is enough – there’s always a tipping point, though I like to think people have learnt from Spitalfields. Change – and young, independent businesses – arriving: amazing. Lack of integration: saddening. Hiked prices, ditto. It’s about balance and that is something that is often lacking. It’s extremely complex – and I wish I was the Gentrification Monitor. I would be totally fascist about using the arrival of good new stuff to support the good old stuff and make everyone appreciate each other. But that would probably never work. 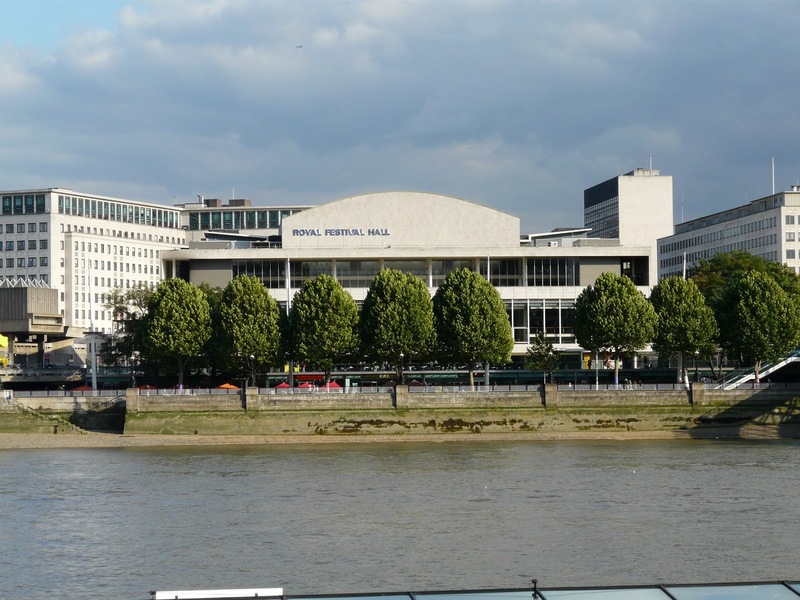 If I said ‘south London’ to you – what six buildings/communities/events would spring to mind immediately? How much interaction are you finding with local writers, photographers and creative? We’d like more! But there’s so much talent – they’re all really busy. So interaction in terms of people to write ABOUT has been amazing. And lastly how important is social media to the magazine – and do you see a print version of belowtheriver in the future? There are plans for some interesting print collaborations afoot… And as for social media – it is absolutely vital to us. Categories: Arts, below the river, Community, Eating & Drinking, local media, Media, Poetry & Literature, south London news, Young people | Tags: below the river, brixton, editor, food, Kate Burt, loughborough junction, media, regeneration, south London, The House in The Junction | Permalink. 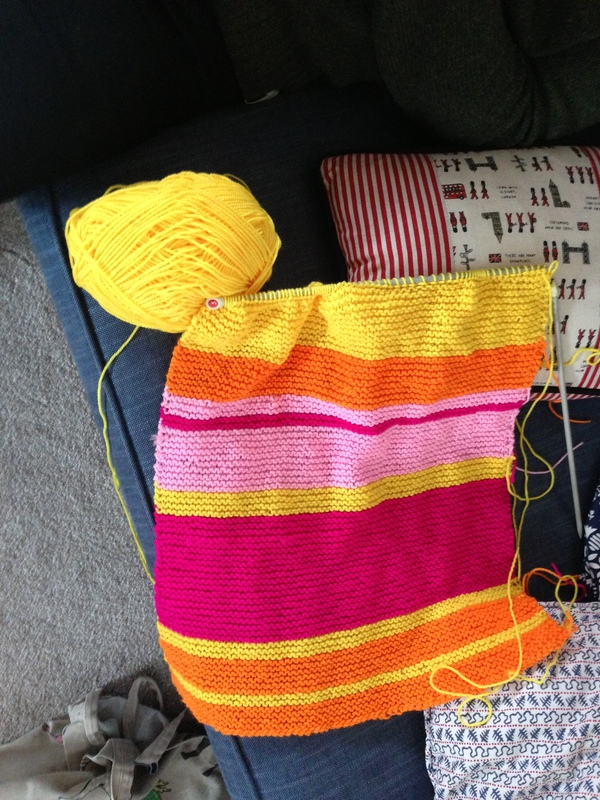 Loughborough Junction BIG LUNCH on 2nd June – get all knitted up! Let’s get in the mood for the Loughborough Junction BIG LUNCH on this SUNDAY, 2nd JUNE. The third ever LJ BIG LUNCH will be held on the Square next to the Hero of Switzerland on Loughborough Road. There will be a BBQ a cake competition and lots of goodies plus entertainment and a CARNIVAL procession from Ray’s Sunshine International Arts C.A.F.E. 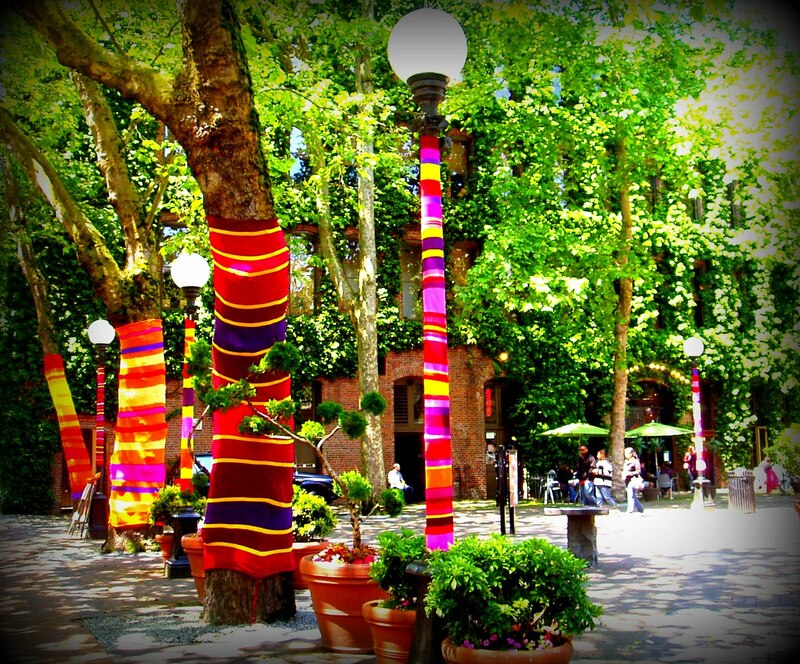 (209a Coldharbour Lane) PLUS look out for Yarn Bombing (or dazzling knitting) organised by The House in the Junction. Check it all out on this Sunday at the Hero of Switzerland pub at 148 Loughborough Rd, London, Greater London SW9 7LL, UK. How we’re hoping the Junction will look on Sunday 2 June – except for the trees of course! Categories: Arts, Community, Eating & Drinking, Events, The L J Action Group | Tags: Big Lunch, Carnival Arts Food Empowerment, carnival food, Hero of Switzerland pub, loughborough junction action group, Loughborough Junction Big Lunch, The House in The Junction, yarn bombing | Permalink. Good Friday turned out to be a shiny kind of day – not only did we have sunshine in the morning – real, actual sunshine but we ended our day getting smiles out of people at a flashmob organised by The House in The Junction. 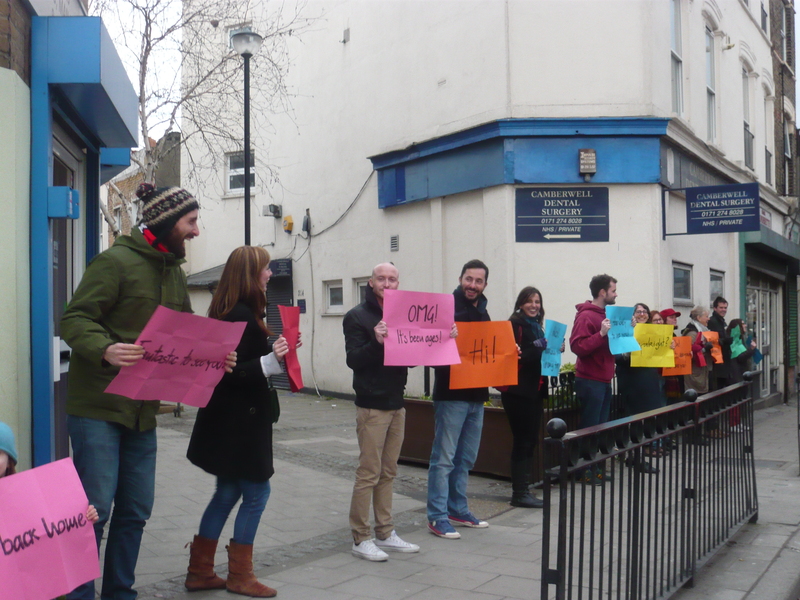 The aim of the flashmob was to ‘welcome people back to Loughborough Junction’ and to make everyone feel at home in LJ. We arrived a little bit late for the initial part of the event but still managed to get two messages to hold out to passing motorists and pedestrians. Mine was a huge favourite, for obvious reasons, saying ‘Oh, I forgot how gorgeous you are!’ Boy did I get some big smiles back – and LJ suddenly felt like a community sharing a laugh … I’m hoping The House in the Junction organise another one soon! While I’m normally shy about these kinds of events, I loved taking part. Even though the sky was grey by 5pm and it was getting very chilly – we were warmed by the smiles, laughter and banter. It was almost as sunny as being in Ray Mahabir’s warm and welcoming C.A.F.E in the arches. Categories: Arts, Community, Events | Tags: coldharbour lane, loughborough junction, The House in The Junction | Permalink.